Growing seasons here in the Arctic are short, and the cloudberries are at the end of theirs. Yesterday was our last opportunity to go picking. After a big pancake, egg and bacon breakfast at a friend’s house, our principal offered up the school’s suburban, so six of us drove out to the end of 7-Mile Road where the berries were rumored to be larger than those we’d previously found. The thermometer read 50, but the chilly wind tugged much of the warmth away, making us happy to be dressed in warm layers. Small songbirds seemed to be everywhere, and a few jaegers patrolled the tundra looking for easy prey. Off in the distance, a majestic snowy owl glided from perch to perch, probably hoping to catch one of the incredibly fat ground squirrels that inhabit the tundra off-guard. Some of the berry patches were completely over, and others were full of fruit past their peak. But here and there we found berries that were just right, liquid amber in color and perfectly sweet. It took Jack and me about an hour to pick 10 cups. Like everything else that grows on the tundra, cloudberry plants reach only a few inches off the ground. They grow in clusters on low mounds that rise a foot or so above the wet ground. Picking them requires lots of squats and bends making for a good workout. Jack was doing an uncharacteristic amount of berry eating while he was picking and finally came to a conclusion: “These berries would make really good sorbet.” Although I’d never made sorbet, I knew right away that he was onto something. Back home, I processed the berries. The first step was to wash the berries. This proved to be much easier than my experience with other berries because there are virtually no bugs up here. The next step was de-seeding the berries. After unsuccessfully trying to smash the berries through two different sized strainers, I remembered I had cheesecloth. I loaded batches of pureed berries into the cheesecloth and squeezed the delicious fruit into a bowl until all that remained in the cheesecloth were bright pink seeds. A couple of years ago, our daughter gave us a Cuisinart ice-cream maker. An electric ice cream maker may seem like an extravagant thing to ship to a home in the Arctic, but it has added a lot of enjoyment to our lives in both making and eating ice cream. Sorbet is easy. Syrupy sugar water and a little lemon juice go into the freezer bowls along with the seeded, pureed fruit. This mixture is slowly churned for about 30 minutes. We love berries, but I think these are my favorites. The color is a rich salmon orange. The smell is sweet and tropical, with mango, papaya and peach flavors, and there’s a natural creaminess about them. Making one-quart batches, we ended up with a gallon of sorbet. We envision serving this in cookie bowls, with a few pieces of dark chocolate, or along with with homemade vanilla ice cream as a sumptuous 50/50 dessert. I’m drooling on my keyboard. Yum! And so elegantly detailed. Thank you. It sounds astoundingly delicious! (even without the chocolate . . . ) I’ve been berry-picking many times, and it’s rare for me to make it home with more than half a bucket in hand–the rest being already in belly! Butter shortbread would be good with it, I’ll bet! Hi Risto. Nice to hear from a fellow cloudberry fan! We have almost every year a lot of wild berries around. I have done similar sorbet also from bilberries and rasberries. 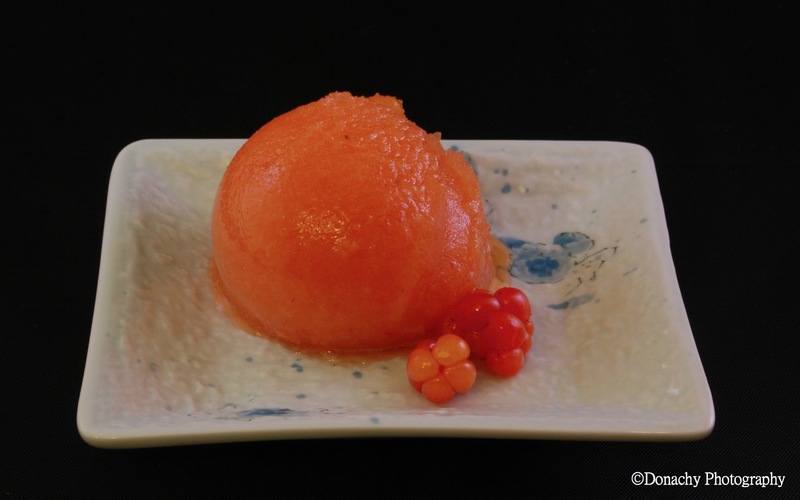 A week ago we had pre Xmas parties, and rasperry and cloudberry sorbets were really succes!